Brazil's Congress has begun impeachment proceedings against Jose Dirceu, a former presidential aide who left the government amid a bribery scandal. 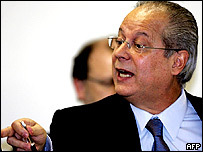 Mr Dirceu denies claims he operated a scheme to secure politicians' support in exchange for public funds. Impeachment hearings also began against two other deputies accused in the scandal - Brazil's worst for years. Mr Dirceu, an ally of President Luiz Inacio Lula da Silva, known as Lula, quit as his chief-of-staff in June. He has said he is innocent of the charges and has refused to resign his seat in Congress - a move that would have spared him from the impeachment proceedings and a possible eight-year ban. "I'm not going to resign, I'm quite calm, I committed no crime," he told reporters as the Congress' ethics council began its hearing. Mr Dirceu has a week to organise his defence. Congress also began impeachment hearings on Wednesday for deputies Sandro Mabel of the Brazilian Liberal Party and Romeu Queiroz of the Labour Party. Some 18 lawmakers named in the scandal could eventually face impeachment. The scandal has dominated Brazilian politics since it erupted in June, when a former ally of President Lula accused his ruling Workers' Party of paying regular bribes for Congressional support.